Throughout this month we’ve invited you to get to know more about GMOs, how the technology has evolved, to sustainable agricultural practices to the balancing act between producing food and protecting pollinators. This week we’re focusing on the importance of agricultural lands and soil health for food production and biodiversity. The availability of farmland is essential to agricultural production. Land use and soil health play a critical role in sustainable agriculture. Let’s first take a closer look at land use. In order for land to be used for agriculture, it must first be suitable for growing crops. Two of the characteristics that make land suitable for use in agriculture include healthy, well-drained and tillable soils, and land with access to adequate rainfall or fresh water for irrigation. However, because farmland is sometimes more valuable when converted into urban and suburban developments, agricultural acreage is shrinking by 50 acres every hour in the U.S. alone. How are GMOs related to land use? 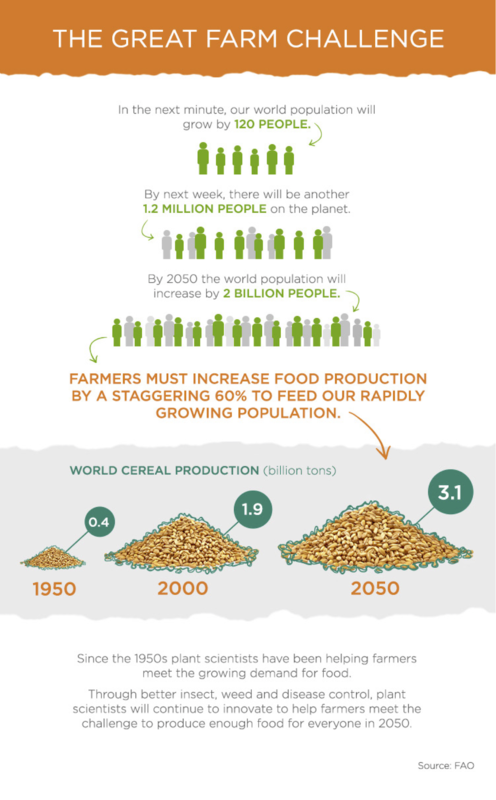 With an estimated world population of 9 billion by 2050, farmers will need to produce 70 percent more food over the next several decades to feed this many people. In addition, we’re currently consuming resources at a faster rate than what the Earth can produce or regenerate in a year. These challenges will require farmers to use all tools available to them to grow more crops for food, fiber and fuel without increasing inputs or acreage in agricultural production. GM crops are one of the tools available to help to grow food more sustainably, protect yields and contribute to food security. According to CropLife International, more than a third of the world's potential crop production is lost each year to pests, such as weeds, insects and diseases. Access to agricultural technologies, like crop protection products and GMO crops, help farmers minimize yield loss from pests, and grow more food without bringing more land into production. By growing crops where they are most suitable to grow, farmers can optimize production based on natural systems. This means that farmers can use the minimal amount of fertilizer, pesticides, water and fuel needed to produce a crop and protect or increase yields. These practices have a direct impact on protecting agricultural land, specifically in terms of soil health. Healthy soils are the foundation of a healthy food production system and environment. From serving as a biodiversity powerhouse to contributing to carbon sequestration, healthy soils are critical to meeting the food needs of the future and keeping agriculture land productive. Soil is an important carbon sink storing 10 percent of the world’s carbon dioxide – more than all terrestrial vegetation and the atmosphere combined. When soil is disturbed, or tilled, carbon dioxide is released into the atmosphere where it is a major contributor to global warming. 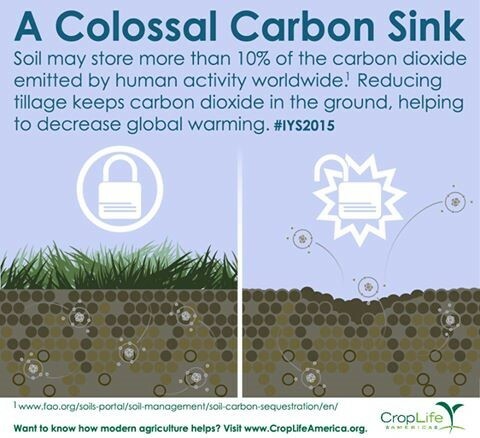 No-till agriculture keeps carbon in the soil and because it requires fewer field passes it uses less fuel than tillage. In 2012 alone, the amount of CO2 saved by using herbicide tolerant biotech crops - that help facilitate no-till - was equal to removing every single car from the streets of London for five years! It can take more than 500 years to form two centimeters of topsoil – the outermost layer of soil, which has a high concentration of nutrients and is crucial for crop growth. Avoiding soil disruption helps keep this top layer healthy and productive. Soil is home to billions of living microorganisms which recycle organic material to maintain soil fertility and support plant growth. 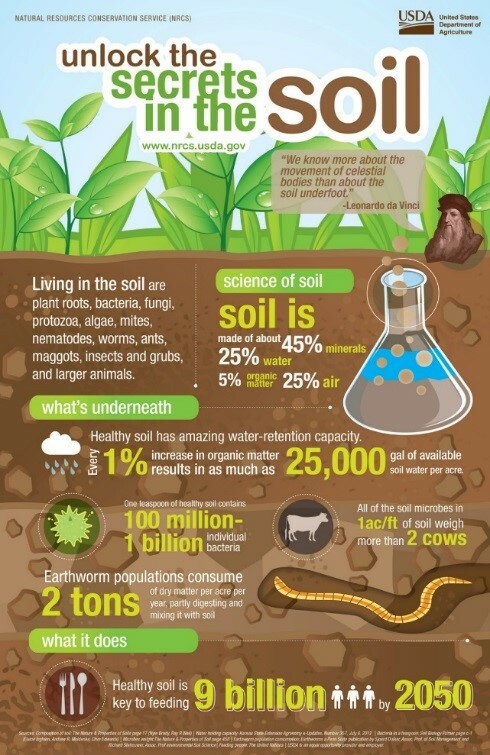 One cup of soil may hold 7 billion bacteria – the equivalent of our world’s human population! Globally, up to 50,000 square kilometers of topsoil – an area around the size of Costa Rica – is lost every year mainly due to wind and water erosion. By using herbicide tolerant crops, farmers don’t need to till the soil to remove weeds so soil retains its structure and erosion is reduced. What role do GMOs play in soil health? In our previous post, we discussed how GM crops help farmers make fewer pesticide applications, conserve water resources, manage fertilizer applications and maintain biodiversity. One of the most valuable benefits of herbicide resistant GM crops is that they assist farmers in adopting conservation tillage or no-till practices. Reduced tillage helps preserve organic matter in the soil, which has numerous environmental benefits. Did you know that tilling releases carbon from the soil into the atmosphere, which can contribute to climate change? Reducing the need for tillage, as with herbicide resistant GM crops, can help reduce fertilizer use and therefore nitrous oxide emissions. EuropiaBio notes that "nitrous oxide has a global warming potential 296 times greater than carbon dioxide." 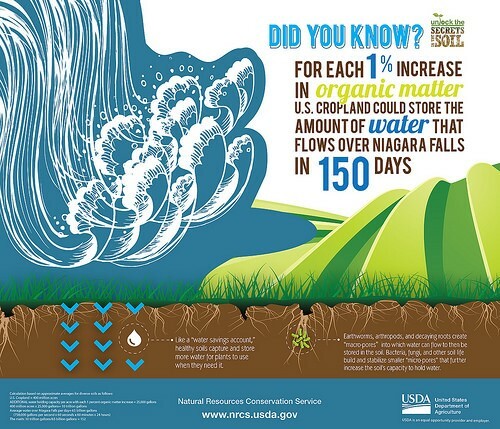 By preserving soil health, farmers can also help protect our environment. Some may think that GM crops negatively impact soil health, but GM crops interact with the soil similarly to other non-GM crops. For example, a common misconception is that GMOs harm insects and microorganisms in the soil. Dr. Nicholas Storer with Dow AgroSciences explains how insecticidal proteins from insect resistant GM crops can be released into the soil, but are not shown to have an effect on earthworms, springtails, nematodes, protozoa, bacteria and fungi. In fact, according to Storer, research shows that these proteins rapidly break down in the soil. In addition, the herbicide glyphosate, which is often used with herbicide resistant GM crops, has not been shown to have adverse impacts on soil microbes. The fact is that GM crops interact with the environment very much like their non-GM counterparts, and can benefit natural resources when used along with other sustainable agriculture practices. From helping farmers produce more food on less land to protecting and contributing to health agricultural soils, GM crops are a tool that will help feed the future. Check back next week for our last post of the month debunking the common myths about GMOs! If you have additional questions, feel free to search our archives or submit a new question.